INTERESTED IN future ISD News and UpdateS? The surge of emergency funds, insurance pay-outs, public assistance funding can make a local economy look like it’s doing well, but one time repairs can disguise the weakness of the underlying “normal” economy. 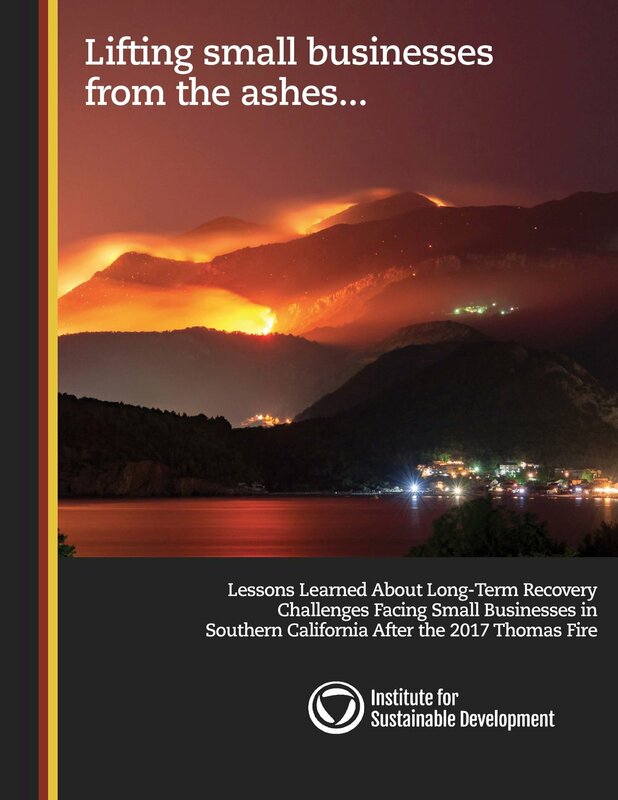 Resilience and recovery funds can help small businesses bridge the transition period until regular customer patterns are restored. Resilience Ready Network - Every community has weaknesses and vulnerabilities. ISD works with government leaders, nonprofit and business executives, and academics to capture best practices, develop strategies, identify needed investments, and build networks to become Resilience Ready. Transformation - (aka the Future of Business and Innovation) -- we are in the early stages of what is sometimes known as the fourth Industrial Revolution or the Digital Revolution. The future of economic growth is predicated on innovation and creativity, and the future of social progress is predicated on this innovation and creativity being diffused and accessible to as many as people as possible. Businesses spend more money philanthropically on education than any other subject; they spend over $240 billion in R&D, and the entire $200 billion advertising and marketing industry alone depends on creativity. However, while there are many local success stories, the US continues to drop in global innovation, science, and math rankings. ISD's Education, Science, Culture and Business Network is designed to bring together leading experts across these disciplines to develop projects, campaigns, and policy recommendations to secure the future of the U.S. and expand its inclusiveness and accessibility. Let’s learn from the past and do better in the future. The Institute for Sustainable Development was founded in the North Carolina Research Triangle in 2003 by a unique partnership of academic, business and philanthropic leaders, which included Duke University and the University of North Carolina at Chapel Hill, the Chapel Hill-Carrboro and Greater Durham Chambers of Commerce, and the Fenwick Foundation. The Institute has trained more than 200 chamber of commerce executives across the United States, and 160 small businesses and non-profits in twelve U.S. states. In July 2017, the Institute started a new chapter to focus on more long-term issues affecting disaster recovery, resilience, and the future. ISD continues to build on its legacy of bringing together business, academic, and other thought leaders to promote partnerships, policies, and projects that promote (a) community resilience and disaster recovery, and (b) long-term community transformation based on applied innovation and sustainable development principles. and over 300 other companies, organizations, and government agencies that have participated in one or more of ISD's briefings, projects or programs since July of last year.